These “drinking vinegars” have a rich history. In ancient times date vinegar was added to water to make it safer to drink. Because of the Vitamin C in shrubs, Colonial American sailors carried them to prevent scurvy. Shrub recipes were also popular in 19th and early 20th century as a means of preserving fruit long past its picking. Today, there are small-batch producers popping up here and there, such as Shrub & Co, The Hudson Standard and DCs Element Shrub. Since fermentation has become hip lately, recipes for homemade shrubs abound on the internet. It’s relatively easy to make, it just requires a 10 day lead-time before it’s ready for consumption. As the weather warms and fruits come into season, shrubs are a lot of fun to experiment with. They are also a way to take a so-so piece of fruit (like the out-of-season stuff at the grocery store) and turn it into something delicious. Photo courtesy of Element Shrub in DC. Credit to Michele Sheiko. I am a huge fan of pickles, sauerkraut and kimchi so I was curious as to what the vinegar would do to a cocktail. 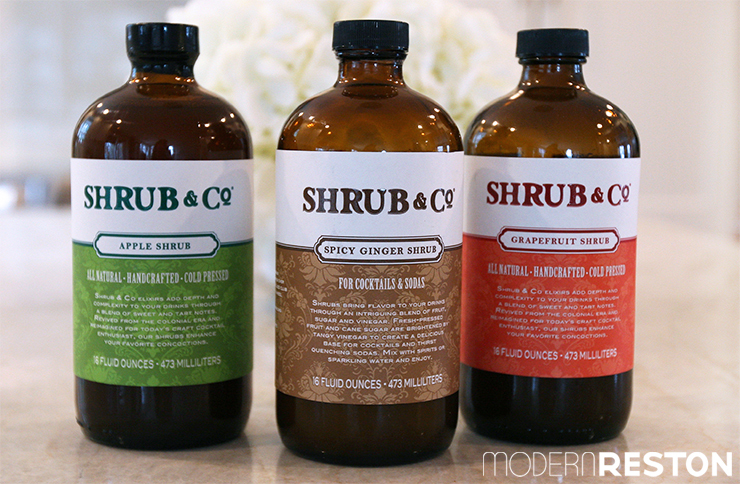 We tried an assortment of Shrub & Co’s flavors and were pleasantly surprised. The tartness wasn’t overwhelming, there was just enough of a bite to know something was different from the standard Moscow Mule but it was crisp and refreshing. Pour vodka, lime juice and shrub into an ice-filled glass. Add club soda, stir and garnish with lime. You can also mix these fruity concoctions with soda water for a non-alcoholic beverage. There has been a plethora of research lately on the benefits of drinking apple cider vinegar for optimal health. This would be a delicious way to get the vinegar down. The following is a recipe from Brooklyn Supper for a Blackberry Shrub to try at home. Because you are fermenting, cleanliness is important to curb bacteria growth. You’ll want to make sure to sterilize your jars before starting. Yields a little more than a quart. Sterilize the jar: Wash the container in hot, soapy water and rinse thoroughly. Submerge in a pot of warm water to cover by 1 to 2 inches, bring to a boil, and boil for 10 minutes. For the lid or cap, wash it in hot, soapy water, rinse well, and scald in boiling water. In the jar, combine the berries and sugar. Use a wooden spoon to mash the berries well. Set in the fridge for two days, checking and swirling fruit, until sugar has dissolved. Pour in the vinegar, shake and swirl everything together, and set in the fridge for 5 – 10 days. Check mixture each day, and give everything a good stir. As you approach the five day mark, start to taste the mixture –– once the vinegar and sweetness have melded and mellowed to your liking, push mixture through a mesh strainer and discard the berries. Pour strained syrup into a clean bottle. Store in the fridge for up to three weeks. Fill a Collins glass with ice. Crush 2 large mint leaves into the side of the glass and drop to the bottom. 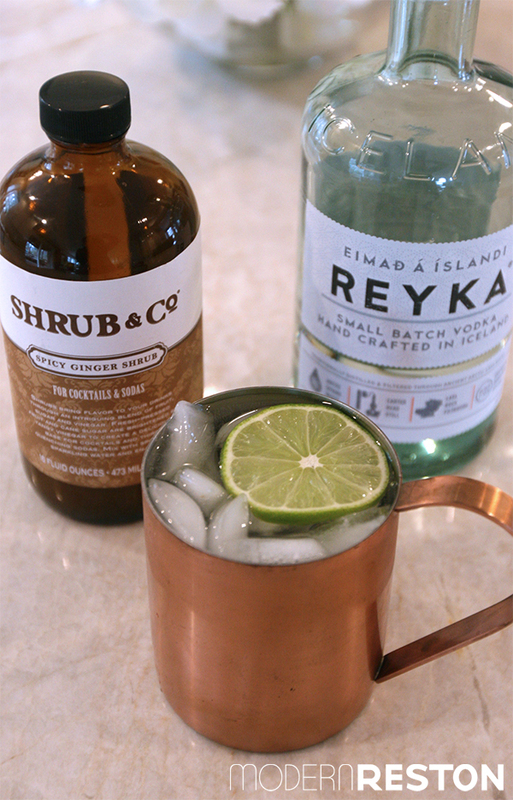 Pour in the shrub and vodka, top off with sparkling water, stir gently, and garnish with a mint sprig. Alternatively, deglaze a pan with this shrub for a delicious sauce with lamb or pork tenderloin. 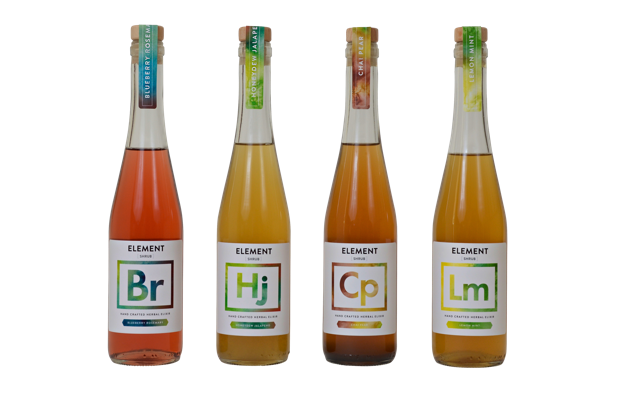 If you are interested in sampling shrubs from Element Shrub they will be holding a free tasting at The Hour Shop in Alexandria Thursday, Feb 12 from 5 – 7pm and another one Saturday, Feb 14 at One Eight Distillery from 1 – 4pm.